With the Sapphire HD 7750 you’re not going to be pushing much past 20 frames per second in most games without seriously knocking back the graphics settings or resolution. With Steam’s TV mode, and a drop in resolution, you’ll be able to get almost gaming-capable speeds at 720p on your telly. For another £20, though, you can get double the gaming performance with an HD 7770, and £50 extra will get you the awesome HD 7850 1GB. If you’re finding your budget stretched for a new graphics card you would be better off saving up for a little longer and paying a little more. The rewards for just that £20 investment are pretty big in gaming terms. 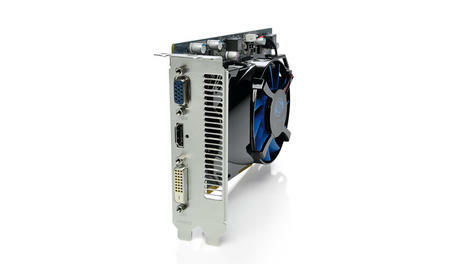 At this low level the Nvidia competition is the GT 640, a graphics card that’s not even permitted the GTX moniker. There is pretty much nothing between AMD and Nvidia at this range, so it would just be a case of choosing whether you might want a low-profile HD 7750 instead of the standard height Nvidia cards on offer. It is possible to get gaming frame rates at this price point, but the sacrifices to graphical fidelity might mean it’s not really worth it.